Capturing knowledge is an important step in the Discovery Process. 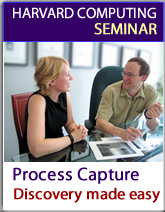 This starts with capturing information from various sources knowledgeable about a process. Unfortunately, written documentation sometimes doesn’t exist and when it does it may be out of date or inaccurate. Direct observation, e.g., following someone through her daily routine to see exactly what she does and how.